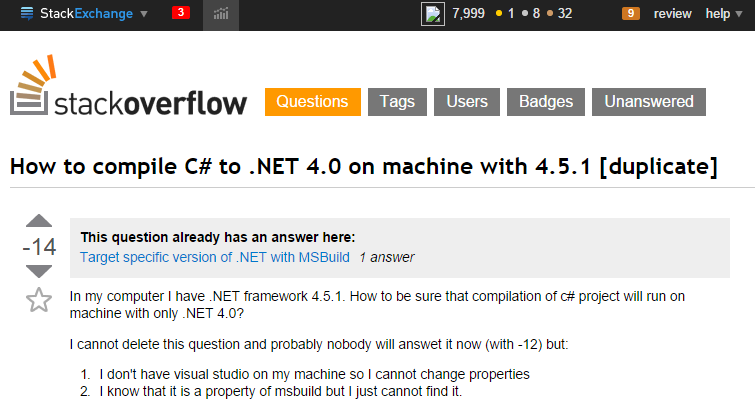 In my computer I have .NET framework 4.0 How to be sure that compilation of c# project will run on machine with only .NET 4.5? Your question and title are totally different. What are you asking? Until I updated my post it had already -8 points and 2 votes to close as not a real question. -8 point is ok ;), but why it is not a real question I don't know. I updated my question to correct one, still forgetting that I didn't mention that I don't have a Visual Studio on compilation machine.